Synthetic peptide derived from residues 700 - 800 of Human Mannose 6 Phospate Receptor. Read Abcam's proprietary immunogen policy . 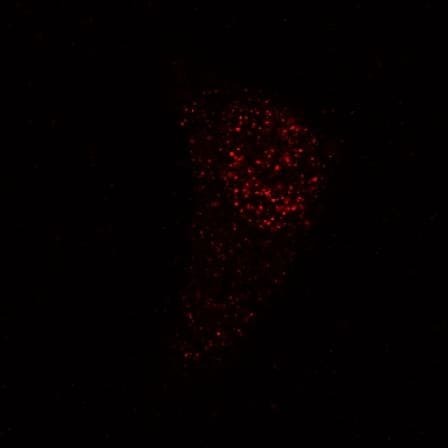 This antibody gave a positive signal in the following Methanol fixed cell lines: MCF-7 cells. Our Abpromise guarantee covers the use of ab12894 in the following tested applications. IHC-P 1/50. Perform heat mediated antigen retrieval before commencing with IHC staining protocol. ICC/IF Use a concentration of 4 µg/ml. This antibody worked well in IF in HeLa cells but not in SK-N-SH cells. Transport of phosphorylated lysosomal enzymes from the Golgi complex and the cell surface to lysosomes. Lysosomal enzymes bearing phosphomannosyl residues bind specifically to mannose-6-phosphate receptors in the Golgi apparatus and the resulting receptor-ligand complex is transported to an acidic prelyosomal compartment where the low pH mediates the dissociation of the complex. 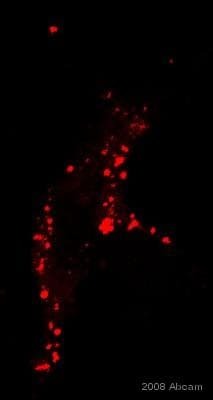 This receptor also binds IGF2. Acts as a positive regulator of T-cell coactivation, by binding DPP4. Belongs to the MRL1/IGF2R family. Contains 15 repeating units of approximately 147 AA harboring four disulfide bonds each. The most highly conserved region within the repeat consists of a stretch of 13 AA that contains cysteines at both ends. Lysosome membrane. Colocalized with DPP4 in internalized cytoplasmic vesicles adjacent to the cell surface. 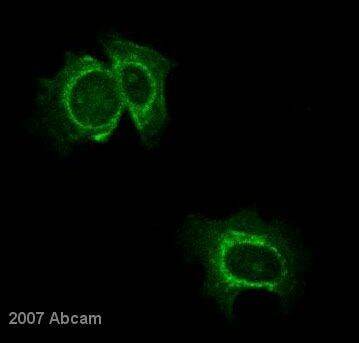 HeLa cells labelled with anti-mannose-6-phosphate receptor (ab12894). ab12894 was used at a working concentration of 4µg/ml. The arrows indicate the perinuclear location of the mannose-6-phosphate receptor in the late endosomes. In the final panel DAPI is pseudo-coloured red, while the mannose-6-phosphate receptor is in green. 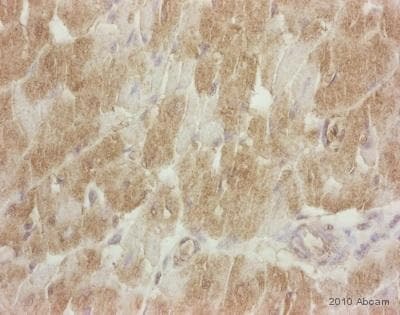 ab12894 at 1/100 staining human MCF-7 cells by ICC/IF. The cells were methanol fixed and blocked with BSA prior to incubation with the antibody for 1 hour. A goat anti-rabbit FITC was used as the secondary. Publishing research using ab12894? Please let us know so that we can cite the reference in this datasheet. Thank you for sharing your results through our Abreview system. I am sorry this antibody did not provide the expected results. I am sorry to hear that you are experiencing difficulties with this product ab12894 in ICC. Often it is possible to make suggestions that help resolve problems. We will happily offer technical support and in the event that a product is not functioning in the applications cited on the product data sheet (and the problem has been reported within 120 days of purchase), and if it appears that the antibody is at fault, a replacement/credit note/refund will be offered. -Have you run a positive control in parallel with your samples to help find out the source of the failure? For this particular antibody, MCF-7 cells are recommended. - Have you incubated the samples with this primary antibody for longer period of time such as for 2 hrs at room temperature or overnight at 4oC? - Have you tested different fixatives to see which is the most optimal solvent to fix the cells i.e. ice-cold acetone, or methanol or ethanol for 5 min (not longer than 10 min)? -I would also recommend using a blocking agent like BSA to reduce the background signal. I hope this information is helpful. Should the suggestions not improve the results, please do not hesitate to contact me again and I will try to provide further help. The immunogens listed for ab12894 and ab2733 seem to be inconsistant. Thank you for your enquiry. I am not sure I understand your question, but did notice that the SwissProt database links on the datasheet point to the cation-dependent MPR, not the cation-independent. If this is your question, I am having the database links changed to the ~300kDa cation-independent form. I hope this information helps, please do not hesitate to contact us if you need any more advice or information.